Earlier this year, Rubio, who co-chairs the Congressional-Executive Committee on China, urged his state's universities to shutdown their Confucius Institutes amid reports that the Chinese government uses the programs to limit discussion on topics the government finds sensitive, such as the Tiananmen Square Massacre or the political status of Tibet. Rubio and other lawmakers, including Rep. Jim Banks (R., Ind. ), have sought legislation that would require colleges to disclose charitable gifts from foreign sources. Banks said the Chinese-backed language programs "pose a serious risk" to American academic institutions and called on his colleagues to do more to protect U.S. research. "We need to send a clear message to American academic leaders: they cannot be naïve to the threat faced by Chinese influence operations through innocuous-sounding groups like Confucius Institutes," Banks told the Free Beacon. The DESI awards granted by the Defense Department earlier this month will support industry-university teams researching power beaming, highly-maneuverable autonomous drones, and metamaterial-based antennas, among other topics related to defense capabilities. Industry partners include Boeing, Northrop Grumman, Skydio, TERA-print, and Visor Corporation. The Pentagon did not respond to requests for comment. Michael Griffin, the undersecretary of defense for research and engineering, told a congressional panel in June the Pentagon was investigating university research partnerships linked to the Chinese government, citing threats of spying and technology theft. He said the department is "not yet as vigilant" as it needs to be to ensure that Pentagon research is not accessible to entities tied to Beijing. Griffin told lawmakers he had not spoken to anyone at the Department of Education regarding Beijing's presence on American campuses, but said he would "be happy to do so." The Department of Education did not respond to a request for comment. 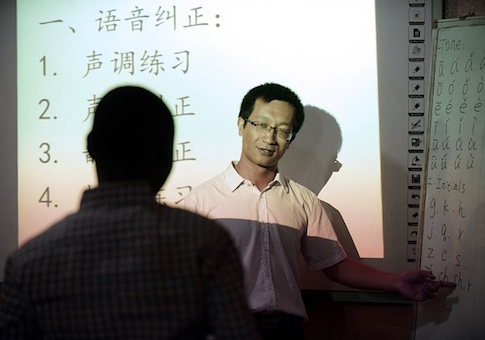 Managed by a division of the Chinese Ministry of Education known as Hanban, Confucius Institutes are a key piece of Beijing's broader foreign propaganda campaign, which costs the Chinese government an estimated $10 billion annually. More than 100 universities in the United States now have direct partnerships with the Chinese government through Confucius Institutes and the U.S. intelligence community has warned of their potential as a spying tool. The concern is particularly pressing at the 13 universities that host both Confucius Institutes and top-secret Pentagon research, including Arizona State, Auburn, Purdue, Stanford, and the University of Washington. In a classified report issued earlier this year, the CIA cautioned against efforts by the Chinese Communist Party to stipulate funding to universities and policy institutes in exchange for academic censorship. The agency warned of the Chinese Communist Party's "strings-attached funding" to American colleges "to deter research that casts it in a negative light."